I’ve completed two quilted wall hangings over the past several months, and I have a huge Fifty State quilt that I eventually would like to hang when it is complete. Personally, I’m not a fan of sewing a sleeve into the back of the quilt and hanging it from a rod. I feel that it pushes the quilt too far out from the wall. And I really don’t want to go the extra step of adding a sleeve. So what to do? Well, I love compression quilt hangers. They consist of basically two bars of wood screwed together, sandwiching in the top of the quilt. Unfortunately, if you are wanting to purchase one, they are not the cheapest things to buy. For the 50″ one that I need for my smaller wall quilts, I’m looking at $70 plus shipping. I can’t even imagine how much it will cost to hang my Fifty State quilt. It measures 8 feet across! But the husband was more than willing to help out here. 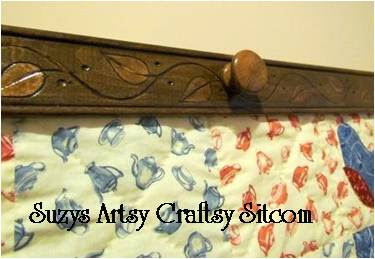 He created one for me for under $20 that is not only beautiful, but easy to make.Are you new to the Sitcom? Be sure to check out my Frequently Asked Questions Page! 2 large metal picture hangers We found the wood at our local Home Depot store. There was much to choose from in decorative trim. You can make this as simple or as fancy as you like! Most home stores will cut the wood there for you if you like, or you can take it home and cut it like we did. First we measured the top of the quilt- 48″ and then added an inch on each side for a total of 50″. Cut the 1″ x 2″ wood and the decorative wood the same length. We used a mitre saw for this, but any saw will do. We cut them each 50″ long and then sanded them. Then clamped both pieces of wood together and measured out where to drill the holes for the four drawer pulls. They will be spaced evenly and as you can see from the photo, you want them a little higher than center of the wood. Drill your holes all the way through both pieces of wood. Use your counter sink drill bit on the back of the 1″ x 2″ piece of wood, widening the holes that you previously drilled. This will allow the head of the wood screw to “sink” into the wood allowing for a smooth surface on the back. Put your wood screws through both pieces of the wood from the back side and lightly screw on the drawer pulls. At this point, we wanted to check it to be sure it was working properly. We turned it on its side and the stuffed in the top edge of the quilt between the two bars of wood. Tighten the screws from behind, while holding the drawer pull from the front. This will anchor the quilt into the holder without damaging the quilt. Pretty cool. So now for some color. I used Minwax Express Color in Walnut. It comes in a squeeze tube that you simply squeeze onto a rag and wipe onto the wood. It is also water soluble, so an easy clean up. Well, let’s just say, you might want to wear gloves anyway. We’ll call it an easier clean up. Ha! I used clear varnish on it and then when all was dry, reassembled it and nailed the two picture hangers on the back near each end. 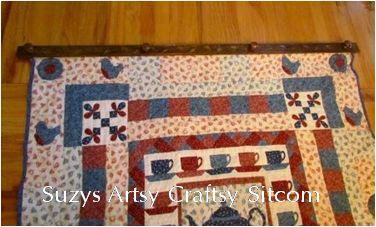 (For a larger quilt, you might consider adding a hanger to the center too). 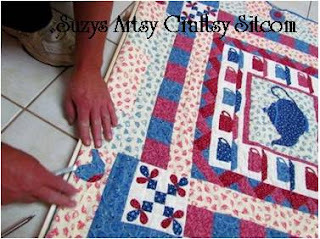 Perfect for hanging the quilt and really easy to do. Actually, the most difficult part of the whole project was getting all that stain off my hands. But live and learn… If you enjoyed this tutorial, you might also enjoy my Faux Carved Wainscoting Tutorial. Another great idea that my husband and I teamed up on. This project creates a great carved look using textured wallpaper!If you are into working with wood and love the wood inlay look, check out my Faux Wood Inlay Tutorial. It’s actually much easier than you think!For over 100 more crafty tutorials for all ages, be sure to visit my Tutorial Page.